To provide dogs and humans a safe place to learn and play as a team. Dogs are given an opportunity to learn flyball, disc, agility, and swimming. Handlers form a partnership to have dogs give their maximum potential. Great for people who love dogs, have a disability and need help training their dogs, or people who have time and energy to interact with dogs for community service. We are a non profit organization devoted to helping animals lead an active life. We teach people and dogs how to work together to have fun, play and learn. We are looking for volunteers to help train and race the dogs at events. We welcome all dog lovers who have the heart and soul to see what dogs can really do with training and attention. 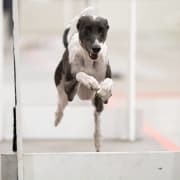 Would you recommend SINCITY DOGS FLYBALL TEAM?